An ambulance crew was attacked in Lurgan earlier today while attending a patient who had been stabbed. While the crew was providing on scene treatment just after midnight, a man opened the side door of the ambulance and removed an oxygen cylinder which he then attempted to put through the windscreen. 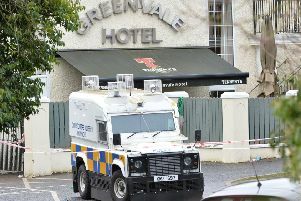 Irreparable damage was caused to the windscreen and the PSNI dealt with the incident, according to a spokesperson from the NI Ambulance Service, who said it could have put lives at risk. The patient is reported as have declined transport to hospital and the crew were able to return to the station to change to a spare vehicle. The damaged vehicle will be out of action until repairs are carried out early next week. In a separate incident in North Belfast a member of ambulance staff was assaulted by a patient while attempting to provide treatment. The crew member was not seriously injured and after recovering made himself available to respond to further calls from the public. The NIAS spokesperson said: "NIAS continually calls for a stop to these attacks. We do not believe that they can be excused in any way as they put the safety of our staff and the wider community at risk. "We will continue to call for the full rigour of the law to be applied against anyone found guilty of such attacks and we note, and welcome, the custodial sentence passed down during the week against one such individual in Coleraine - albeit pending an appeal."